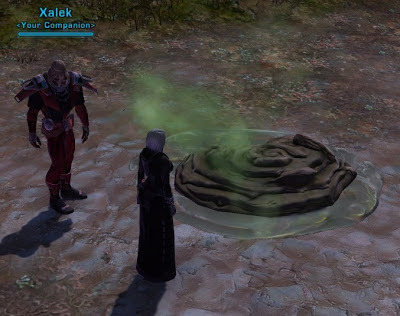 Going Commando | A SWTOR Fan Blog: Crap! One thing that amuses me is how this game still throws me a curveball every now and then, even after I've been playing it regularly for one and a half years. Last night I did the Section X dailies on Imperial side for the first time. Up until then I thought that quests in SWTOR had certain minimum standards. By that I mean that while some of them may essentially come down to the "kill ten rats" model, they wouldn't do anything like... wallow in poo jokes. I'm a high-ranking dark lord of the Sith and you want me to do what? It's huge. It's steaming. And it contains "biological samples" for the daily quest Hyperbiology. To be fair, you don't actually have to dig through the giant turds. There are plenty of other sources of said samples, whether it's from killing k'lor'slugs, crushing animal eggs or picking bones off the floor. But, you know... it's the principle of the thing. I'm not going to argue with you on this one. Yeah, they ARE weird. Digging through heaps of excrements is extremely unbecoming for a member of the Dark Council, but then again, so are most daily missions. If I remember correctly, every WoW expansion had players interacting in one way or another with faeces. To this day I’m not entirely sure what to make of all this. Maybe it’s simply something that one shouldn’t overthink.